Comment Who needs Super Nintendo when you can have Amiga CD32 and Superfrog? 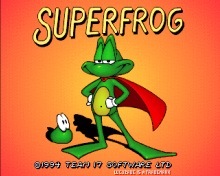 Superfrog is one of those unforgetable titles that you remember by heart. Team 17 was one of the biggest and most respected Amiga developers around the time when Superfrog was released, and it seemed they were unable to fail with their games. They had previously released the ULTRA-KILLER Alien Breed and Project X, and Assassin was also a very popular title. They would later on create the oh-so-popular Worms series, which took them even higher for a while, but eventually took them down even lower than they were before, and today they are almost forgotten. But let's talk about the times when computers were cool instead! Superfrog is an ordinary jump'n'shoot platformer, but still an unique Amiga title because of it's super-smooth graphics and wonderful levels. We had already seen Gremlin's Zool one year earlier, but it wasn't much of a Sonic the Hedgehog-killer people had spoken of. Superfrog however, was the first game that proved that you don't need to own a Super Nintendo to play a great platformer! The game tells the story of a young prince, who is turned into a green frog by the Evil Witch when he tries to stop her from kidnapping the beautiful Princess. He later finds out that he has superpowers as a frog, and decides to rescue the princess in order to restore the kingdom. This is presented to the player through an opening sequence animated by no-one less than Eric Schwartz! (author of Sabrina Online). The graphics of Superfrog may look simple, but you will soon realize how amazing it is. It's not overdone in anyway, not too much and not too less. You can clearly see where all objects are, and it plays absolutely 100% smooth, even when Superfrog is running faster than the wind after he picks up a turbo bonus. Not like Zool, which would get choppy at some stages when there was much on the screen or fast animation. 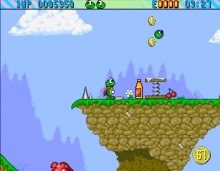 The controls are easy to master, and Superfrog has his blobby assistant friend, Destructo Spud (who pretty much looks like a green tennisball with eyes) which you as the player can throw at enemies. You can also pick up wings, which enables Superfrog to hover for a while when in the air. The musical part of this wonderful game is... wonderful. It is composed by Allister Brimble who also made the music in Alien Breed, Assassin, Body Blows, Overdrive, Project X, and pretty much every other Team 17 game at that time (my favourite from Allister is the Mortal Kombat music however!). It's very cute and fits the game perfectly. You will eventually find yourself hooked as you discover yourself humming the melodies even when you've turned off the computer. The CD32 version isn't improved at all from the floppy version, except there's no loading time and the controls has been updated a little (2-button support). It would have been cool to hear the music as CDDA instead, but the game is so good anyway so it's really nothing to complain about. There is no save feature in the game, so instead it uses a password system. The player collects coins during each level, and at the end of every level you get to GAMBLE. You are taken to the slot machine where you can gamble with the coins collected. You have to win the password for the next level, which is a cool idea for the game, but can also be frustrating if you need to turn off the game and were unable to win a password. You can also win extra lives! This makes an excellent CD32 title as the game is very console-like. People with Super Nintendo and Sega Megadrive were spoiled for years with beautiful platformers, so now it was finally time for Amiga owners to enjoy a top-quality platformer. Superfrog rulez!